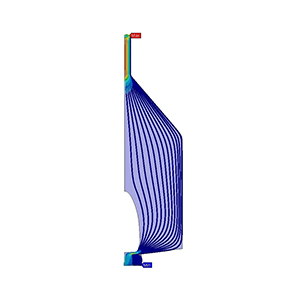 FEA-Solutions (UK) Ltd - Finite Element Analysis For Your Product Design | 009: Air Sampler 2D axisymmetric fluid flow analysis of an air sampler, subjected to air flow at different flow rates. Particle tracking has been conducted to simulate dust deposition. Recommended design improvements have been implemented and verified by a subsequent simulation.